We no longer offer this product but have something even better to meet your needs. Find it here. Hydra Recharge is the 1st shampoo with encapsulated beds of superfruit goji berry, plus passion fruit and kiwi fruit water*. Hair is ultra-hydrated, weightlessly silkier and softer. Massage shampoo into wet hair, lather and rinse thoroughly. For best results, use with the Garnier Fructis Hydra Recharge Conditioner and Treatments. Rated 5 out of 5 by BeachBaby from Best shampoo I've ever found Hydra Recharge is simply the best shampoo I've ever found for my long wavy hair, and now I can't find it anywhere. Your suggested replacements just aren't nearly as good! Please bring it back! I've been using only your shampoos (used to be Sleek & Shine until I found Hydra Recharge) for years, but I'm going to have to try other companies now in search of something that cleans as beautifully as HR did. Rated 5 out of 5 by Mrika from Best Shampoo I have ever used Please, bring this shampoo back. Why it was discontinued ? Rated 5 out of 5 by AmadaForbes from Garnier's Biggest Mistake I've been using this shampoo and conditioner since it first came out and samples were mailed to me back when I was still in highschool! 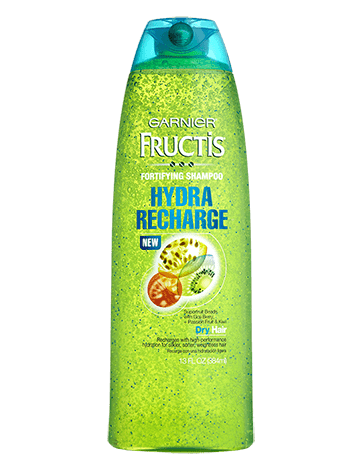 There has never been another product that made my hair feel as beautifully refreshed as Garnier Fructis Hydra Fortifying Recharge. I've recently moved into a new apartment and since their bottles aren't the largest, I chose to buy a different name brand product and suffer for a while to save some money as we settled into our new home. Next thing I know, I'm looking through shelves feeling like I'm going crazy because I can't find my beloved product anywhere! Please, please, PLEASE reconsider the decision to discontinue this item because as I sit here mortified by this heartbreaking news and as I read through these comments, it seems this was a great seller, and your so called "better" replacement isn't doing as well. Rated 5 out of 5 by HydraRechargeFan from Please bring it back Hydra Recharge was my favorite shampoo and conditioner. I tried "Triple Nutrition" shampoo as a substitute and I don't like it nearly as much. Rated 1 out of 5 by Abi Wan Kenobi from Buying it overpriced on eBay :( PLEASE BRING BACK! I am so frustrated that this product was discontinued since I absolutely loved this shampoo and used it with the hydra recharge conditioner. I loved it so much that I even bought it on eBay when it was discontinued. I just ran out of the shampoo and now I have to buy it overpriced on eBay again because I do not like any of the other products that have been suggested as replacements. PLEASE reconsider discontinuing it!!! I will continue to buy this product off eBay for now, but I hope to see this back in stores eventually.